It is an oft-lamented fact, both locally and nationally, that the city of Cleveland hasn’t taken full advantage of its position on the shore of Lake Erie. The national media, in its seemingly boundless enthusiasm for stories about the declining fortunes of the city where I live, is quick to point out that we haven’t taken advantage of what may be our best asset. Whether the publication is Forbes (Most Miserable City, Sixth Fastest Dying City) or Portfolio Magazine (Third Most Stressed City), the attention can start to feel like a cheap shot. Inevitably, they turn the blame for the city’s problems onto itself with observations like this one: Why hasn’t Cleveland developed its lakefront into an asset like the city of Baltimore or San Francisco? Now NPR has run a story on the “teardown” of the West Shoreway freeway, highlighting plans to turn it into a tree-lined boulevard and break down a major barrier to the lake. The reporters liken the project to Milwaukee’s rejection of the Park East Freeway and San Francisco’s refusal to rebuild Embarcadero Freeway, turning high-speed roadways into parks. But what’s really going on in Cleveland is a little less revolutionary. Ironically, the city is getting positive press for a project of debatable merit. NPR may have jumped the gun when it said the city was converting the freeway into a “slower, tree-lined boulevard.” So far, project sponsors have been unable to get the speed limit reduced legislatively. Other important attempts to make the road more pedestrian-friendly — such as the addition of stoplights and crosswalks — have been thwarted at the state level. It’s not clear just yet that the angry driver quoted by NPR has anything to worry about. Currently, Cleveland’s lakefront is occupied by a massive public park, a private airport, the port, a water treatment plant, and the Cleveland Browns’ stadium. All of this is cut off from downtown and the city’s neighborhoods by a limited-access highway: Route 2, or the East/West Shoreway, as it is known locally. West-siders and downtown visitors hoping to access the lake must use one of a handful of poorly lit, deteriorating pedestrian tunnels that run under the highway. Otherwise, they can drive to the park via an exit on Route 2. 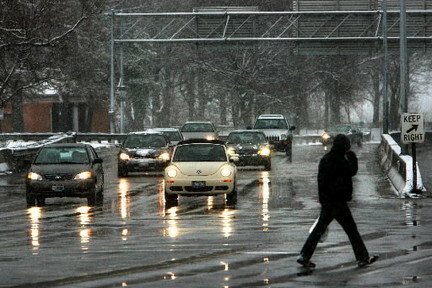 Several years ago, city planners and neighborhood activists on the west side hatched a plan to reconnect city residents to Lake Erie by converting the West Shoreway into a pedestrian-friendly boulevard. Planners recommended reducing the speed limit from 50 to 35, adding stoplights with crosswalks and installing a bike path. Despite almost universal recognition of the importance of lake access, advancing the plan was not the slam dunk you might expect. In order to lower the speed limit, the state legislature would have to formally act in favor of the proposal. Although local planners estimated the reduction would cost the average commuter a mere 70 extra seconds of travel time, the legislation stalled in the statehouse. Even city council members from the farther-west wards of Cleveland came out against the plan, joining a powerful opposition group of suburban commuters. Furthermore, in order to convert a limited-access highway into a boulevard with stoplights that would allow for pedestrian crossing, the plan would have to be approved by the Ohio Department of Transportation. After reviewing the proposal, ODOT nixed the stoplights, saying they would increase congestion. The city was forced to scale back plans. Planners returned to the drawing board. What they came back with, and what NPR is now celebrating, bears a strong resemblance to what the roadway planners set out to replace. And the big losers, predictably, are pedestrians. Rather than installing traffic signals, the city will invest $2.7 million in rebuilding and improving its pedestrian tunnels. Plans to redesign the highway with boulevard-style medians and the addition of trees are moving forward, but most of the aspects of the plan that would make the lakefront more accessible have been removed. Although the addition of a bike and pedestrian trail survived, since it will be located on the lakeside of the highway, even bicyclists will have to access the paths through one of the tunnels. Still, City Planning Director Bob Brown sees the plan as an improvement. He envisions the redesigned Shoreway as a near-replica of Chicago’s Lakeshore Boulevard. And perhaps his vision will coalesce. Cleveland’s Route 2 is undoubtedly already one of the state’s most scenic highways. The problem is those who currently benefit most from Cleveland’s prime position on Lake Erie are suburban commuters. The state’s policies advance the notion that Cleveland is a place to drive through, not a place to live. The next time Cleveland appears on a national list — poorest, saddest, most-maligned — you might check for a few other likely targets: Cincinnati, Toledo, Youngstown, Dayton. When the writers point the finger of blame back at the cities, it’s worth considering their common thread: beyond sharing an industrial heritage, they’re all part of a state with a set of policies that actively undermines cities. The fact that the state of Ohio, in the form of a highway, is standing between Cleveland and its lakefront just goes to show how difficult a position these cities are in. This sort of story lends credence to the argument that State DOTs should not have jurisdiction over roads in urban areas. Whether Ohio, Pennsylvania, or New York, State DOTs are just plain ignorant of what is best for our inner cities. Young, talented people who want to live in good cities in Ohio want to leave because our state government refuses to support good urbanism that attracts and retains us. You should cross post this on Rust Wire if it’s allowed. Something is pretty wrong with placement of traffic lights and speed limits not being controled at the local level. So heartbreaking. Cleveland really has moved on from the days of building grand stadiums and museums to attract the day visitor and is doing so much on the livability end. To be really clear: I want to live there. I’m planning a house-hunting trip in the next few months as a direct result of their innovative policies that will improve life IN CLEVELAND, not make it as painless as possible to pass through. But I won’t live there any time soon. I’ll unfortunately have to buy a house as a (probably terrible) investment awaiting the day when I can reasonably count on walking, riding my bike, and taking transit to pick up daily necessities in a central-ish area (having once been laughed at for trying to figure out where to buy clothes hangers while living downtown without a car). So come on, State of Ohio, Cleveland is really trying here and has genuninely learned from past mistakes. Support your cities, and they will be the engines of your growth. FREE CLEVELAND!!! You are asking us to take anther look at untouchable ODOT, the greatest empire in Ohio, ranking only with OTC. Untouchable, Reigning, un-cutable, non-elected . I would suggest that that will never happen, right along with rail corridors and public transportation in this dying state. Check out http://www.bythesweetwatersea.blogspot.com for more details on this project. 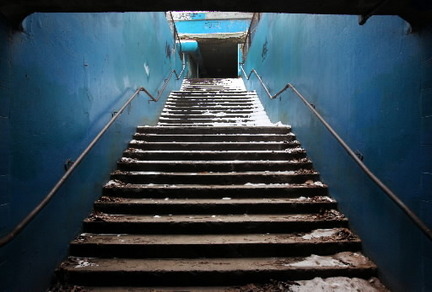 The article is misleading by showing a picture of a staircase in the West 76th St. tunnel that will be eliminated. The tunnel will be bike accessible. Construction of this $1 milliion improvement started last fall and will be completed in the summer of 2011. Jeff is right. The article is misleading. I live very close to where the photo was taken at the top of the article. The claim that I don’t have easy access to the lakefront is simply not true. I walk there everyday with my dog through the West Blvd entrance. I also run there and bike there. It’s beautiful. I wouldn’t live anywhere else in Cleveland or Ohio for that matter. I agree with Angie, and disagree with Jeff and Tim. I live on W 76th, so I’ll have easy access to the lakefront once construction of the tunnel is complete, but that’s not the point. The point is that turning the highway into a street would generate great long-term outcomes for the neighborhood. Every single thing you buy at your local grocery store gets there by HIGHWAY! So what? By the time it gets to the local supermarket, it has probably left highways and entered streets.